November 11, 2013. Thomas O’Byrne. Perched 25 metres off the ground upon a mountain ash tree, Hannah Patchett’s new home lacks the luxuries enjoyed by most 20-year-olds. But the bright red treehouse, high in the Toolangi State Forest 80 kilometres north-east of Melbourne, was designed for a purpose – to highlight the plight of Victoria’s faunal emblem. 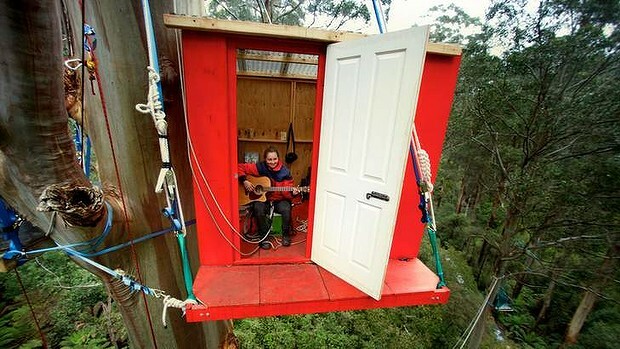 The spartan treehouse is located in a small pocket of old-growth mountain ash forest that forms vital habitat for the critically endangered Leadbeater’s possum. ”I’m calling for an end to logging in the area, so that the Leadbeater’s possum has a chance at avoiding extinction,” Ms Patchett said. She has pledged to remain in the 14-square-metre home until the state government announces plans for protecting the endangered creature. The Department of Environment and Primary Industries lists logging as a threat to the marsupial’s diminished population. Environment Minister Ryan Smith announced $1 million in funding to implement proposals stemming from the group’s ideas. No Replies to "Protester occupies forest treehouse to protect Leadbeater's possum Read more: http://www.theage.com.au/victoria/protester-occupies-forest-treehouse-to-protect-leadbeaters-possum-20131110-2xa5p.html#ixzz2s1kK30dk"